Being 20-odd feet of runabout it has a lot of cockpit; four or five could fish here without other people’s elbows bothering them. It could equally be a family day out sort of boat but, unlike the traditional family boat, its basic design lets it cope with non family-friendly weather. The weather protection is excellent. The well braced canopy covers an area beyond the seats and has competent clears for days of spray. The Targa carries hand grips at its rear for standing passengers. There are just the two seats in its shelter and they are superb - resilient, adjustable, equipped with bolsters; supremely comfortable. They are a contrast to the second class seating which is an upholstered box at the transom. 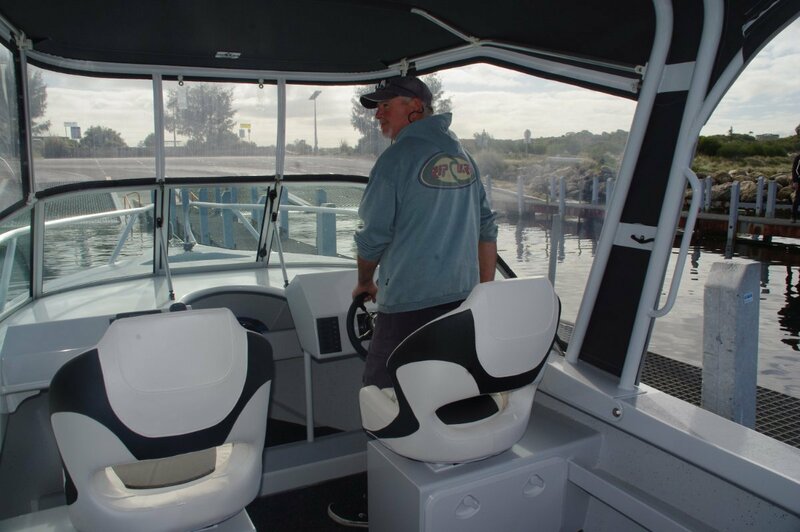 On the other hand they are well aft of the slam zone – such as it is: this is a soft riding boat with 20 degree deadrise. The under deck volume is consumed by a cellular structure of intersecting web frames. Some of the cells are the water ballast containers, two are the 140 litre catch tanks, and another contains the 180 litre fuel tank. All other cells are foam filled. As well as providing handy containers the structure makes for great strength – based on bottom plating as thick as a Rottnest ferry. The ballasting arrangements are totally automatic and barely noticeable. Launch the boat and within seconds the ballast tanks are full delivering the stability of a jetty. They stay full at manoeuvring speeds. 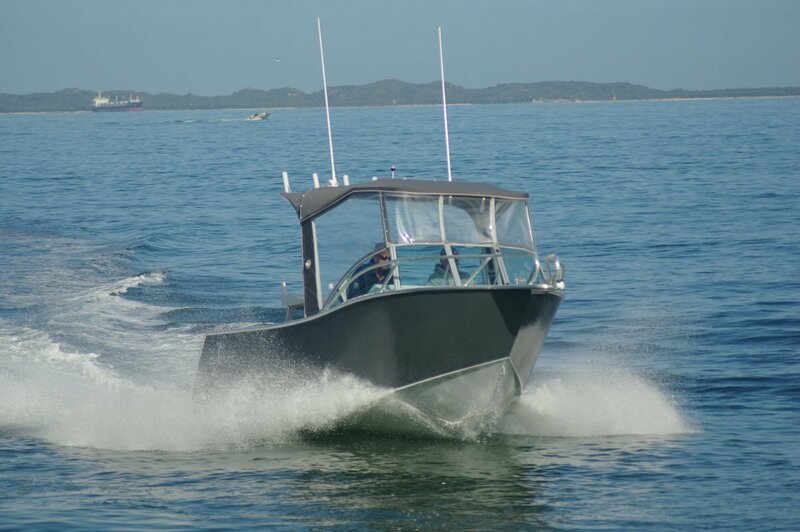 Once in unrestricted waters opening the throttle sets the boat planing in the usual way without any noticeable hesitation. 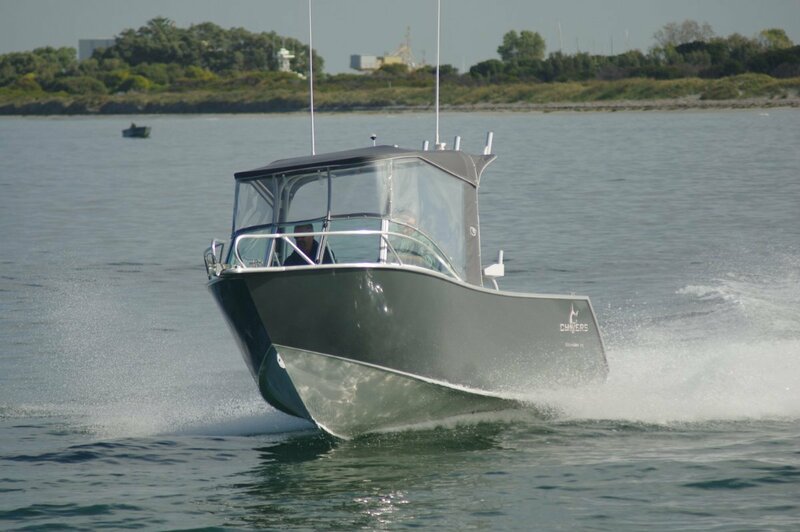 Naturally all that stability on demand greatly enhances the Thresher’s appeal as a fishing boat. This is a quiet boat. The supremely rigid hull and the foam filling play their parts as does the motor. This was a Generation 2, 135hp Evinrude E-TEC. A two-stroke in name and mechanical conformation, in every other way it is something different. The high pressure fuel injection and a string of other magic ingredients remove all the traditional annoyances. Instant starting and an absence of exhaust smoke are thoroughly welcome. So is the fuel consumption: claimed to be significantly more frugal than the competition, although we were unable to take measurements. There is no question about the performance it produces: top speed in the flat conditions nudged 40 knots. The Thresher’s paint job is up to the builder’s usual standards and features not-quite-white around the driving position. White at first glance, compared with a sheet of paper it revealed the truth that it was pale grey. Small though the difference was it made a big difference to glare. Other builders have gone to the extreme of matt black to achieve a similar result, with the additional property of minor depression for the skipper. Areas of no paint at all are the gunwale rubbing strips and the rails. The latter, rather than following the hull’s flare, are set inside the gunwale’s footprint ensuring that the rails do not become de facto fenders. Another protection measure is for the ears of those on board. Chain inside aluminium anchor wells can make maddening noises in choppy conditions. Some owners line their wells with carpet; this builder has already done it. The windscreen centre opens for access to the anchor, and the foredeck in way of it has a recess; a curved one for the ease of the anchorer’s belly. Runabouts do not always use their under-foredeck space well, but here is the obvious place for bulk stowage and the Chivers caters for it. A shelf and a pounded area below will absorb a lot of gear. Additional stowage is provided under the seats and in the side pockets.